@olejegcord Just cast my first vote for you and joined the ark community last week! Glad to be a part of it. Can confirm that Profit sharing has been at 90% for sometime now to stay competitive with other delegates even though the proposal shows 85% and have not been updated yet. Quarkpool is steady and always near the top and have shown to change % profit share, # of excluded votes for payouts, etc. as needed to stay near the top. I’m sure Quarkpool will continue to change and update to stay competitive with the new wave of new delegates trying to join late in the game, perhaps potentially covering the TX fee in the future. @jabbys I just saw on dafty’s calculator that quarkpool will change the minimum payout to 1 ark now? Is this true? Dear Users! 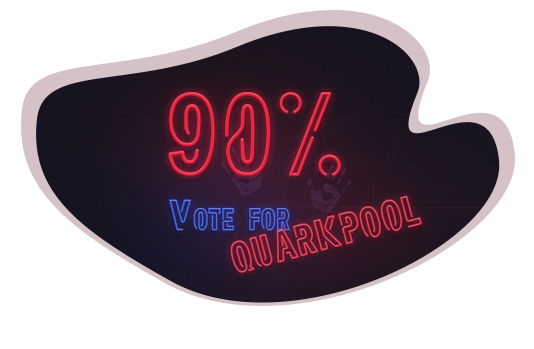 The award from the pool “quarkpool” is now 90% and will remain so all the time. For the next week, the pool gives the award 95%. I’ll be very glad of your voices! @olejegcord thanks for being a delegate! I am a small stake holder currently but am keeping my eyes on the market. At the wallet size i have now, it would take more than a year to get to 4 Ark min payout. A lot can happen over a year. I was wondering if you decided to pack up and get out of dodge would you set your min payout to be very low or would my accumulated piece of the pool share vanish? @NHLroyrocks Don’t worry, you’ll always get your payment . In the future, the pool will be improved and all my constituents will be happy. Soon, I update my offer to the community. Today, the pool has moved to a new server, and access to the site at Quarkpool.pro will be available within 24 hours. Payments to the previous mode. After the domain is reinstalled, the payment interval will be every 12 hours. At the end of the following month, the minimum payment will be 3 ARK. @olejegcord this link still seems down from my end?! any word on when it shall be up and running again properly please. @jonnyenglish The site works http://quarkpool.pro/ . You can also walk through the IP http://176.103.48.24/stats/ . As soon as I put the certificate, everything will work as before. The payment interval is now 12 hours. At the end of the next month, the minimum payment drops to 3 ARK. Would you like a minimum payment of 1 ARK or 4 ARK (payments interval is 12h) ? The new payments will be selected based on the results of the survey. A survey was recently conducted to reduce the waiting time for the award. Unfortunately, there were very few people involved in the survey, so I came to the next decision. “quarkpool” pays its voters a reward if the user has 4 ARK in the account. But most users have to wait a long time for payment, which is why I’ve decided to lower the timeout. As of 1 January, the payment will be effected at 3 ARK, in February with the achievement of 2 ARK and in March - 1 ARK. If users like this approach, we can speed up payments and make payments every 24 hours if you have 0.2 ARK in your account. Today, awards have been paid to all users. As of 1 December, the payment interval will be 24 hours, when 1 ARK is reached. I hope you’ll enjoy your new payouts. If you have not received the payment, write me a letter as soon as possible. I’m thinking about to change the delegate with higher minimum payouts now, because this speedup of the payments cost’s me a lot more transaction fees than before where the minimum ARK amount was 4! I cost’s now 2,23 more ARK an fees within a month than before if you get 1 ARK a day. Can you please increase the amount of ark within the payment period? To a minimum of 4 or 5 ? Looks like your connection to Delegate QUARKPool - From 1 to 14 January was lost, please wait while we try to reconnect.